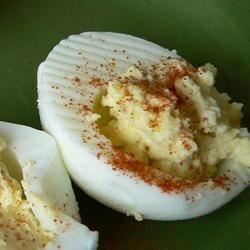 "Perfectly spicy deviled eggs, I gar-on-tee!" Slice eggs in half lengthwise. Remove yolks and place in a medium bowl. Set aside egg whites. Mashing with a fork, mix mayonnaise, Dijon-style mustard, salt and black pepper with the egg yolks. Fill the hollowed egg white halves with the yolk mixture. Sprinkle with cayenne pepper, adjusting the amount to taste. Cover and chill in the refrigerator until serving. I made these eggs and had it revised for servings of 30 which enclude 15 boiled eggs, however, I thought it was tooo salty. Due to a previous review saying they were too salty, I reduced the salt by half. Still salty!! You might want to add a tad more mayonnaise also. Otherwise were good. These were TERRIBLE! My husband is not a picky eater at all and he loves deviled eggs, but he only took one bite. We both thought these were just awful. Way too salty! Good. Didn't use salt & next time I will mix the Cayenne into the eggs. So-so. I've had much better. Would not make these again.